Go to original pattern for design DROPS 76-6. DROPS Cardigan and Pullover in Silke-Tweed and Vivaldi. Scarf in Puddel. DROPS 5 mm [US 8] and 5.5 mm [US 9] needles, or sizes needed to obtain correct gauge. Gauge: 15 sts x 21 rows with 1 strand Silke-Tweed + 1 strand Vivaldi = 10 x 10 cm on larger needles in stockinette st.
Rib: * K 4, P 4 *. repeat from * - *. Pattern: See charts. The entire pattern is knit in reverse stockinette st.
Sizes S + XXL: dec 4 sts. Size M: inc 2 sts. = 90-96-102-108-114 sts. After Pattern 1 knit Pattern 2, then continue with 1 strand light blue Silke-Tweed + 1 strand Vivaldi to finished measurements. When the piece measures 20 cm dec 1 st at each side every 5-5-6-6-6 cm a total of 8 times = 74-80-86-92-98 sts. When the piece measures 65-67-69-71-74 cm bind off for armhole at each side every other row: 3 sts 1-1-2-2-3 times, 2 sts 1-2-2-3-3 times and 1 st 3-3-3-3-3 times = 58-60-60-62-62 sts. When the piece measures 84-87-90-93-96 cm bind off the center 16-16-16-18-18 sts for the neck. Bind off 2 sts at each neck edge on the next row = 19-20-20-20-20 sts remain on each shoulder. Bind off when the piece measures 86-89-92-95-98 cm. Left front: Cast on 50-50-58-58-58 sts on smaller needles with 1 strand beige Silke-Tweed + 1 strand Vivaldi. Knit Pattern 1 - knit the first 4 cm in rib keeping 1 st at each edge in garter st. Start the rib with P 4 at the side and finish with K 4 rm at the center front (seen from the right side). Then change to larger needles and knit reverse stockinette st as on back. On the 1st row after the rib dec 4-1-6-3-0 sts evenly distributed = 46-49-52-55-58 sts. When the piece measures 20 cm dec 1 st at the side every 5-5-6-6-6 cm a total of 8 times = 38-41-44-47-50 sts. When the piece measures 60-63-66-69-72 cm dec 1 st at the center front for V-neck every 4 rows a total of 11-11-11-12-12 times. At the same time when the piece measures 65-67-69-71-74 cm bind off for armhole at the side as on back. After all armhole and neck shaping is complete 19-20-20-20-20 sts remain on shoulder. Bind off when the piece measures 86-89-92-95-98 cm. Right front: Cast on and knit the same as the left, reversing all shaping. Sleeve: Cast on 50-50-50-50-50 sts on smaller needles with 1 strand beige Silke-Tweed + 1 strand Vivaldi. Knit Pattern 1 - knit the first 16 cm in rib with 1 st at each edge in garter st. Change to larger needles and reverse stockinette st. On the 1st row after the rib dec 6-6-3-3-3 sts evenly distributed = 44-44-47-47-47 sts. After Pattern 1 knit Pattern 2 to finished measurements. At the same time when the piece measures 17-17-18-18-18 cm inc 1 st at each side every 4-3.5-3-2-2 cm a total of 8-9-9-11-11 times = 60-62-65-69-69 sts. When sleeve measures 48-47-45-43-42 cm bind off for sleeve cap at each side every other row: 3 sts 2-2-1-1-1 times, 2 sts 2-2-3-3-2 times and 1 st 1-3-5-7-11 times, then bind off 2 sts at each side until the piece measures 56-56-56-56-57 cm, then bind off 3 sts 1 time at each side. Bind off the remaining sts, the piece measures approx. 57-57-57-57-58 cm. Right side: Put a marker on front 26 cm down from shoulder (where neck shaping begins). Pick up along right front and along neck to center back with 1 strand beige Silke-Tweed + 1 strand Vivaldi on smaller needles as follows: 92-92-108-108-108 sts up to the marker and 54 sts to center back = 146-146-162-162-162 sts. Knit as follows from center back (1st row is a wrong side row = right side when the collar folds out): K 2, * P 4, K 4 *, repeat from * - * and finish with P 4 and 4 sts in garter st at bottom edge. You should have P 4 under the marker and K 4 above (seen from the right side). After 1 cm make 6 buttonholes evenly distributed. Place the bottom buttonhole approx. 25 cm from lower edge and top buttonhole approx. 1 cm below the beginning of neck shaping. 1 buttonhole = bind off 1 st, on the next row yo over the bound off st. When band measures 4 cm bind off all sts up to the marker = 92-92-108-108-108 sts (bind off in pattern). Continue rib over the remaining 54 sts (= collar). The first K 4 above the marker knit in garter st. At the same time inc 1 st every other row at center back between P 2/K 4. Twist the increased sts when you first make them so that you will not leave a hole, then P all the increased sts. Continue until the collar measures approx. 15-17 cm (12-14 sts have been increased at the center back, so there are 14-16 P sts at center back). Then inc all K 4/P 4 to K 5/P 5, and inc in every 4th st over the 14-16 P sts at center back = 82-85 sts. Knit 1 row in rib without increases, then bind off in rib, the collar measures approx. 16-18 cm. 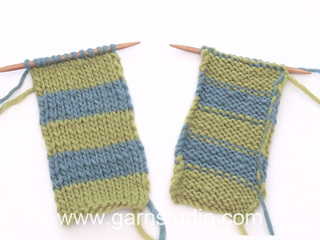 Left side: knit the same as the right, reversing shaping. Sew the collar at center back. 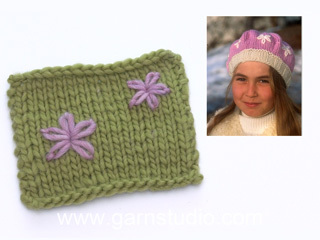 Pockets: Cast on 26 sts on smaller needles with 1 strand beige Silke-Tweed + 1 strand Vivaldi. Knit stockinette st keeping 1 st at each edge in garter st. Start at arrow of chart for Pattern 1 and knit until pocket measures approx. 15 cm - adjust to end after 1 full stripe of the pattern - then knit 4 rows garter st in the next color of the pattern, bind off. 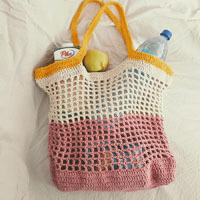 Knit a second pocket. Sew pockets with knit side out on fronts approx. 8 cm from center front - match up the stripes on pocket and front. Sew in sleeves. Sew sleeve and side seams using edge sts as a seam allowance. Sew on buttons. 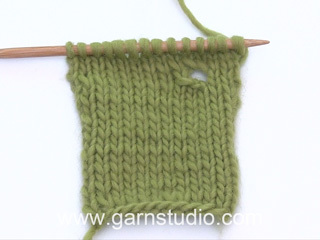 Gauge: 15 sts x 21 rows with 1 strand Silke-Tweed + 1 strand Vivaldi on larger needles = 10 x 10 cm. Rib: * K 4, P 4 *, repeat from * - *. Pattern: See charts. The pattern is knit entirely in reverse stockinette st with 1 strand each Silke-Tweed and Vivaldi. Front: Cast on 66-70-78-82-90 sts on smaller needles with 1 strand each denim blue Silke-Tweed and Vivaldi. Knit Pattern 1 - knit the first 4 cm in rib keeping 1 edge st at each side in garter st. Start the rib with K 4 (seen from the right side). After 4 cm change to larger needles and reverse stockinette st.
On the 1st row after the rib dec 1 st in sizes S + L + XXL and inc 1 st in sizes M + XL = 65-71-77-83-89 sts. When the piece measures 10 cm inc 1 st at each side every 7-8-8-9-9 cm a total of 3 times = 71-77-83-89-95 sts. After Pattern 1 knit Pattern 2, then continue with 1 strand each light blue Silke-Tweed and Vivaldi to finished measurements. When the piece measures 32-33-34-35-36 cm bind off for armhole at each side every other row: 3 sts 1-1-1-2-3 times, 2 sts 1-2-3-3-3 times and 1 st 2-2-3-3-2 times = 57-59-59-59-61 sts. When the piece measures 46-48-50-52-54 cm bind off the center 13 sts for the neck. Then bind off at each neck edge every other row: 2 sts 1 time and 1 st 3 times = 17-18-18-18-19 sts remain on each shoulder. Bind off when the piece measures 52-54-56-58-60 cm. Back: Cast on and knit the same as the front but start the rib with (seen from the right side) K 4 in sizes S + XL + XXL and with P 4 in sizes M + L - and on the 1st row after the rib dec 1 st in sizes S + L + XXL and inc 1 st in sizes M + XL = 65-71-77-83-89 sts. 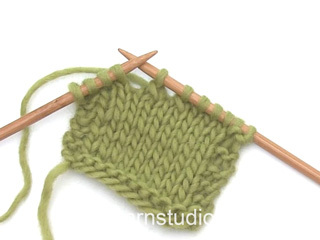 Bind off for armhole as on front and continue until the piece measures 50-52-54-56-58 cm. Now bind off the center 21 sts for the neck. On the next row dec 1 st at each neck edge = 17-18-18-18-19 sts remain on each shoulder. Bind off when the piece measures 52-54-56-58-60 cm. Cast on 50-50-50-50-50 sts on smaller needles with 1 strand each denim blue Silke-Tweed and Vivaldi. Knit Pattern 1 - knit the first 16 cm in rib keeping 1 edge st at each side in garter st. Then change to larger needles and reverse stockinette st. On the 1st row after the rib dec 6-6-4-4-2 sts evenly distributed = 44-44-46-46-48 sts. At the same time when the piece measures 17 cm inc 1 st at each side every 6-4.5-4.5-3-2.5 cm a total of 6-7-7-9-10 times = 56-58-60-64-68 sts. After Pattern 1 knit Pattern 2, then continue with 1 strand light blue Silke-Tweed + 1 strand Vivaldi to finished measurements - at the same time when sleeve measures 49-47-46-44-43 cm bind off for sleeve cap at each side every other row: 3 sts 2-1-1-1-1 time, 2 sts 2-3-2-2-2 times and 1 st 1-3-6-8-9 times, then bind off 2 sts at each side until the piece measures 56-56-57-57-57 cm, then bind off 3 sts 1 time at each side. Bind off the remaining sts, the piece measures approx. 57-57-58-58-58 cm. Neckband: Pick up 56 or 64 sts (divisible by 8) around the neck on smaller needles with 1 strand each light blue Silke-Tweed and Vivaldi - if you pick up more or less sts dec/inc evenly distributed on the 1st row. Knit rib for 2 cm. Bind off in rib. Sew left shoulder and up along neckband. 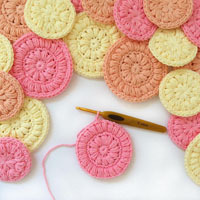 Embroidered blossom: embroider a blossom with 2 strands Vivaldi. The blossom should be approx. 22 x 22 cm and placed at center front. Sew in sleeves. Sew sleeve and side seams using edge sts as a seam allowance. 100 gr nr 01, natural white. DROPS 8 mm [US 13] needles, or size needed to obtain correct gauge. Gauge: 9 sts in garter st = 10 cm wide. Garter st, when knitting flat: Knit all sts, all rows. Scarf: Cast on 16 sts loosely and knit garter st back and forth on needles. Bind off when the piece measures approx. 120 cm. = beige Silke-Tweed + Vivaldi. 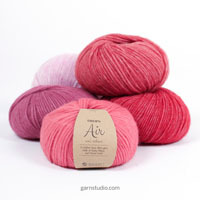 = dusty pink Silke-Tweed + Vivaldi. = burgundy Silke-Tweed + Vivaldi. = denim blue Silke-Tweed + Vivaldi. = light blue Silke-Tweed + Vivaldi. = natural white Silke-Tweed + Vivaldi.